We’re spending a few days in Mid Wales this week, and so thought we could tick off a few more from the 100 List. The weather last night was very rough here with the wind trashing through the trees, rattling the windows and the rain lashing the hills behind the house. But by morning the worst had passed overhead and the sun was beginning to shine. Looking north along the promenade towards the end of the walk where we are about to kick the bar. centre of all things exciting – for me that was a Knickerbocker Glory from the Wimpey Bar! I have led a sheltered life. 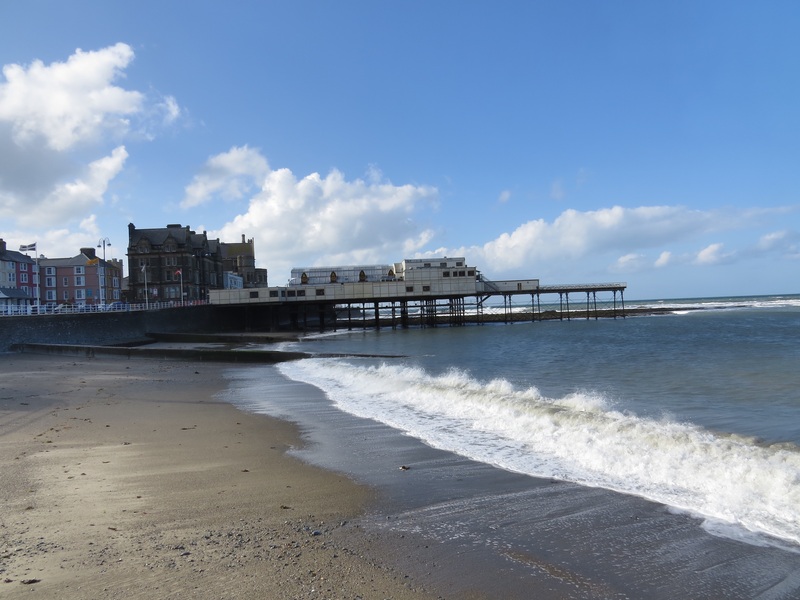 The beach at Aberystwyth never held an attraction for me. Here the beach was dark sand, rocks and large shingle banks. Tywyn on the other hand had 6 miles of golden sand and in the right weather good surfing breakers. Looking south towards pier. The original University can be seen behind. This gothic style building was originally built as a hotel when the railway arrived in Aberystwyth. 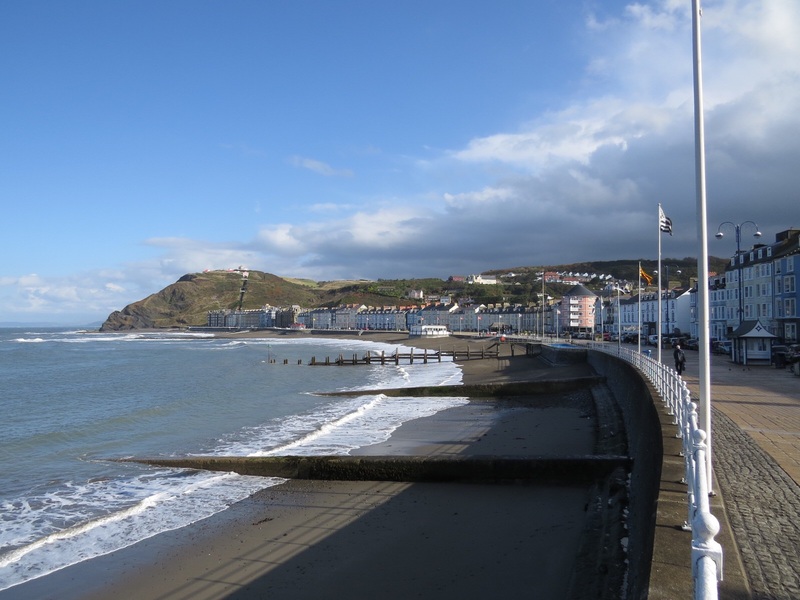 There are two tick list activities in Aberystwyth. The first challenge we took up was to kick the bar at the end of the northern end of the promenade. No one really knows where this tradition came from. One version comes from the fact that the all female university residences were at this end of the town, and the boys used to kick to bar to get their attention. Not sure about this one, with wind howling off the sea you’d really need to kick the bar hard to be heard. 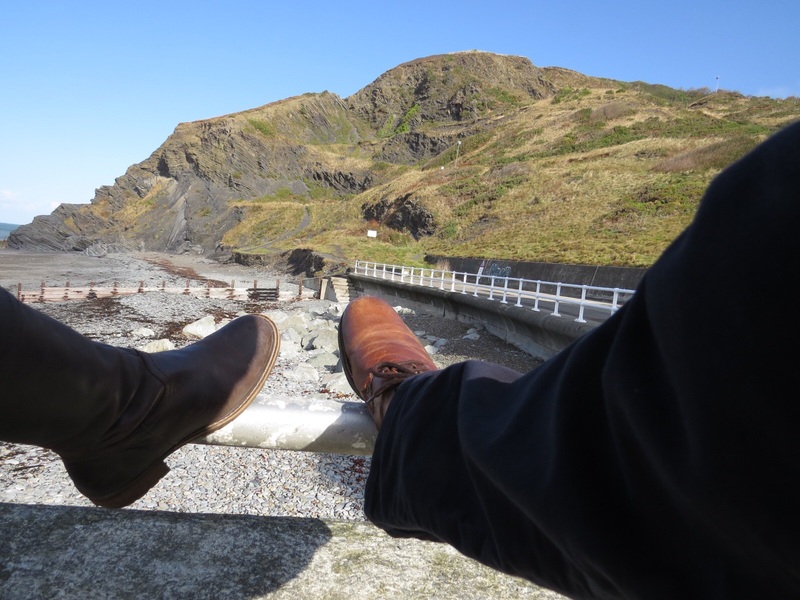 Kicking the bar – we didn’t try the Two Footed Kick. Another comes from the earlier days of the university when students were encourage to exercise the length of the promenade as a protection against TB. Today students kick the bar for luck before exams, and if you manage to kick it with both feet you’ve a greater chance of a First. Mind you I think you’d be lucky not to end up with a serious injury trying that. Either from missing the bar and ending up on the beach, or sustaining a head injury by falling over. After kicking the bar we wondered around the back streets. 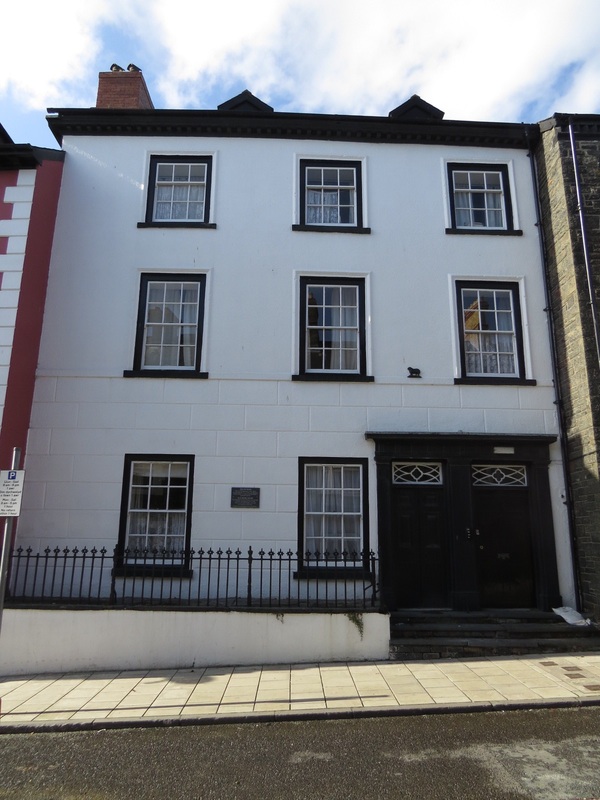 This house, Yr Hen Dy Banc ( The Old Bank House) opened as the first bank in Aberystwyth, and possibly Wales, in 1760. Known as the Ship Bank it served the shipping community in Aberystwyth. 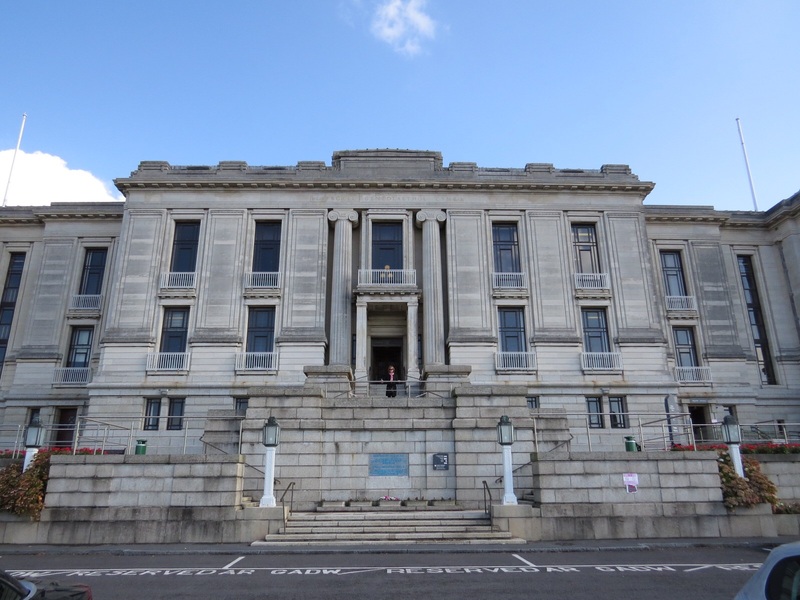 Aberystwyth also houses the National Library of Wales, Y Llyfrgell Genedlaethol Cymru. This is at the top of the hill overlooking Aberystwyth next door to the modern University. I’ve never been in here before, despite having visited Aberystwyth countless times in the past. So by competing this list it is taking us to places we’ve never been before. The library houses millions of books, ancient manuscripts and photos. So we thought we’d have a look around. 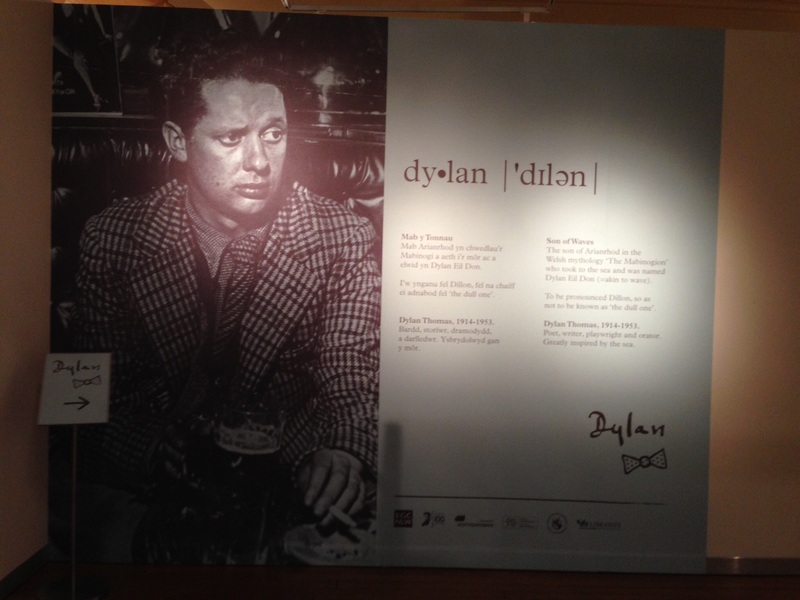 Unfortunately the main exhibition of some of the medieval manuscripts was no longer open, but there was a major exhibition devoted to Dylan Thomos. The front facade to the library, Aunty eager to get in and “discover things”. After scooting around that we ended up registering with the library and we are now Members of the National Library. The two main reading rooms are huge, but almost everything is digitalised, and so there are few books as such on the shelves. We did have a go a trying to find out a few things, but we didn’t have much time. However, we did find out that in 1758 Griffith Pugh had an arrangement with Henry Arthur, Earl of Powis, relating to lead mines and its waste. I knew about lead mining in the valley, but didn’t realise Bryndinas was also included. So another 2 items ticked off the list. Another place visited that I’ve never been before, and two firsts for Aunty. Not allowed to take photographs – probably already on the black list.